In this paper, I discuss the notion of autochthony and its interpretation by Sardinian beekeepers. My aim is to analyze how, through the interpretation of history and tradition, some beekeepers develop a dynamic concept of autochthony that contrasts with the regional and national politics of environmental management. In doing this, two different positions emerge within the community of beekeepers itself: a more ‘cultural’ perspective promoted by the association of beekeepers Apiaresos and a more ‘scientific’ vision supported by the Organization of Producers Op. Terrantiga. By focusing on the ‘Issue of eucalyptus,’ I will show how the perception of being part of the territory leads to the development of a positive perspective towards certain ‘allochthonous’ species of Sardinia. The practice of beekeeping fascinates many people. Recently, the inexplicable massive loss of honeybees reported in several countries around the world, known as Colony Collapse Disorder (hereafter, CCD),  has drawn the attention of scholars, scientists, politicians, filmmakers, and many others who are concerned about the survival of these insects. As the cultural sociologists Lisa J. Moore and Mary Kosut have stated, since 2006 honeybees have become part of an ‘eco-political discourse.’  A simultaneous rise in the demand for honey and fear of the introduction of so-called ‘fake honey’ in the global and national markets have played an important role in the development of protocols for the production and distribution of honey and honeybees in many countries. Thus, local governments have to deal with the international concern for honeybee welfare, biodiversity safeguarding, and policies for the protection and valorization of local products. Together, these factors influence the activity of European beekeepers in the cities as well as in rural areas. Even though CCD does not seem to have occurred in Sardinia, the beekeeping sector has faced a negative trend in production since 2008. According to the Sardinian beekeepers, the reasons for this crisis lies in the inability of the Sardinian politicians to develop adequate plans of environmental and natural resource management that ensure the availability of wild and cultivated forage for the production of honey. From the standpoint of beekeepers, the incapacity of the members of the Sardinian council in acknowledging the specific characteristics and nature of the practice of beekeeping leads the Regione Autonoma della Sardegna (Autonomous Region of Sardinia) to issue programs that negatively affect the beekeeping sector, preventing the production of honey. The paper I present here is part of a wider research project, which I currently conduct as a PhD student at the Institute of European Ethnology of the University of Vienna, which studies beekeeping in Sardinia with the aim of analyzing how this activity is connected with the processes of identity production activated by the different social actors involved. This work is situated as a contribution to studies of processes of heritagization (the process through which objects, places and practices are turned into cultural heritage) and identity construction in European countries. Indeed, in Sardinia, the discourse about loss of bees, protection of biodiversity, and the commercialization of honey quickly tangles with identity issues, and links with different interpretations of the concept of autochthony, intensifying the conflict between the community of beekeepers and the Sardinian council. In engaging with beekeeping in Sardinia, I used a participant observation approach, which includes the use of a professional camcorder during fieldwork. To analyze the different forms of power and capital that are at play in the field of Sardinian beekeeping, I combine segments of participant observation with beekeepers during visits to their apiaries with formal interviews with the spokespersons of the community of beekeepers, the formal delegates of the Regional Council, entomologists from the University of Sassari, and with some of the policymakers. Furthermore, my fieldwork allowed me to participate in conferences and cultural events organized by these different groups. 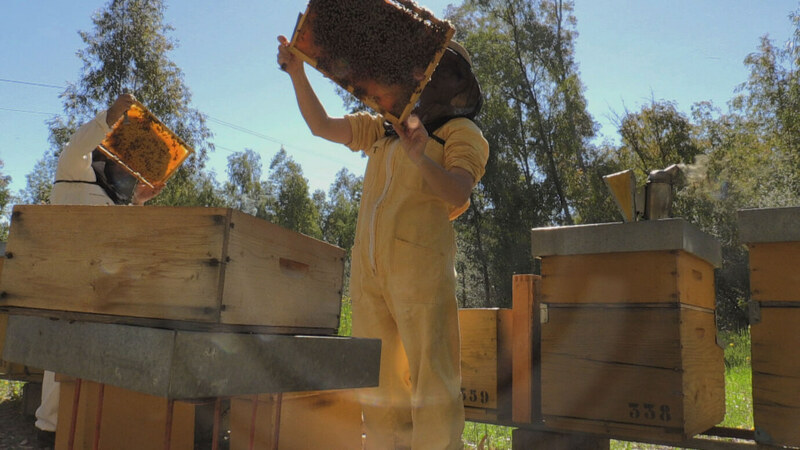 The intertwined connection of the field of beekeeping in Sardinia with discourses on bees, environment, tradition, biodiversity management, and heritage represents a major challenge to developing an effective method of research and analysis. On a small scale, the relationships between humans and bees and humans and environment are built through the everyday practices of beekeeping. Fig. 1: Luigi inspecting his hive. A shot from the fieldwork. | Photo: Greca N. Meloni. Fig. 2: This shot shows the beekeepers from Sarrabus (Sardinia) enacting swarm prevention. | Photo: Greca N. Meloni. Fig. 3: During a blaze at the apiary. | Photo: Greca N. Meloni. Fig. 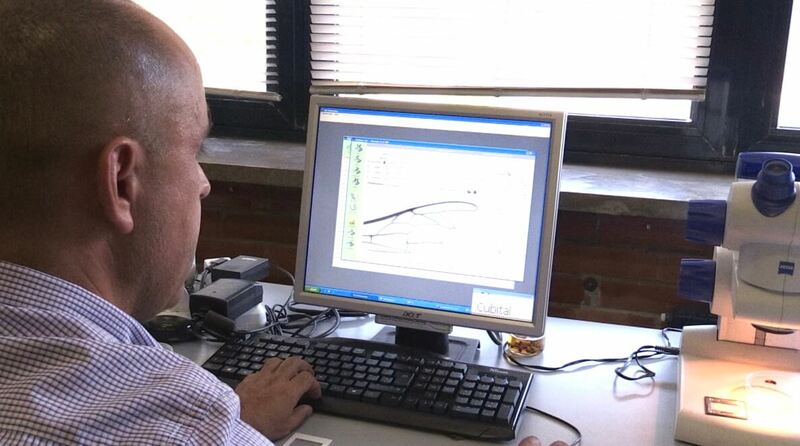 4: Dr. Franco Buffa demonstrates the morphometric analysis used to determine the races of honeybees. | Photo: Greca N. Meloni. The beekeeper constructs his relationship with bees and the environment through his work, creating an intimate relationship that involves his entire body. Practices and techniques are directly linked with how the beekeeper thinks and constructs the relation between human, bees, and environment. To this effect, the use of a camcorder has proven particularly suitable for providing access to the world of beekeepers due to this tool’s capacity to investigate a non-verbal world that does not translate into ‘word-and-sentence-based’ anthropology. The camcorder enables me to follow different phases of the work, providing documentary evidence on material and technical aspects of the job. Furthermore, use of the camcorder enables the beekeeper to feel like a co-producer of the ethnographic research because of his role in choosing the theme, the schedule, and the activities to shoot. Because of the implicit possibility that the footage might be displayed multiple times, perhaps in front of a large audience, the camcorder leads beekeepers to perceive the shooting moment/place as a sort of stage in which to ‘interpret himself’ and ‘get on the stage.’ The practice of beekeeping itself, which is linked to the corporeality of the beekeeper who through his body, gestures, and actions following a precise rhythm is configured as a sort of theatrical performance. In addition, during the interviews, beekeepers used the camera (and, by extension, me) to send a message to the ‘others’ with whom they have a conflictual relationship, such as other beekeepers, trainers from the Sardinian Agricultural agencies, and politicians. When approaching the field of beekeeping in Sardinia in 2016, I began by examining different materials, including manuals on beekeeping, journals of apiculture (particularly Italian ones), visual material, books about the history of beekeeping on the island. This preliminary work was fundamental to understanding the global and general discourses on honeybees in which the field of beekeeping in Sardinia is framed and to pinpoint its peculiarities. I began making contact with the community of Sardinian beekeepers also through Abieris di Sardegna, a closed Facebook group created by beekeepers, and made direct contact with the main spokespersons. In this respect, my personal kinship within a family of well-known beekeepers has contributed to facilitating easier access to the community of beekeepers. This aspect represents one of the key points of my fieldwork, not only because it determines my role within the field, but also, as I will show later on, my possession of practical knowledge about beekeeping has determined the kinds of relationships established between me and the informants. But while my family history helps the members of the beekeeping community to perceive me as part of their group, it generally only facilitates my first contact with the beekeepers, who accept contact with me as a way to show respect and friendship for the family that they believe I represent. Indeed, the fact that I am related to a family of beekeepers does not necessarily provide me with any competence to speak about beekeeping with another beekeeper. The fieldwork that I have carried out thus far has highlighted the necessity of proving that I possess a certain knowledge of beekeeping to build relationships with Sardinian beekeepers. These relationships demand finding a common language that enables the researcher and the beekeepers to both share their expertise. Practical know-how or expertise is a crucial matter for beekeepers. This knowledge is the tool that beekeepers use to classify the world that they know and to define the difference between the ‘us’ and the ‘others.’ Sardinian beekeepers attribute significant value to knowledge that enables them to build their personal selves as well as their professional identities. It is what distinguishes them from each other, the ‘good’ beekeepers from the ‘clumsy,’ the ‘experts’ from the ‘hobbyists.’ Outside of master/novice apprenticeships, professional beekeepers do not like to share their expertise with inexperienced people. Through their knowledge, beekeepers develop a vision of the world that enables them to build their relationship with the honeybees, with the environment, and with the whole ecosystem. Thus, my embedded knowledge and direct experience in beekeeping allowed me to better define my place in the field and to negotiate the terms of my research with the informants. 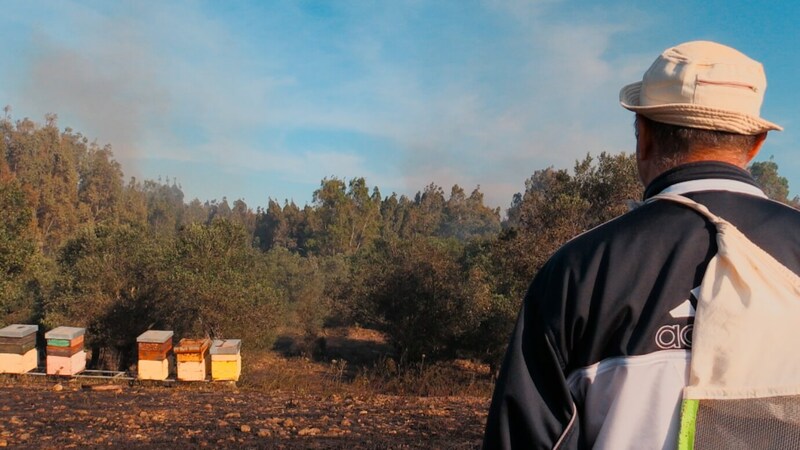 In this respect, I focus on the knowledge and personal view that beekeepers have of themselves and of Sardinia, and how this vision enters in conflict with the hegemonic representations of Sardinia and Sardinians elaborated by the policy makers. These two positions fit into the wider Sardinian socio-political context described above, which sees different social actors involved in a process of identity construction that aims to affirm the ‘unicity’ and ‘authenticity’ of the population of Sardinians, often in opposition to the ‘Italian ruler.’ Within this general situation, the Sardinian beekeepers, whether or not they are formal members of Apiaresos or Terrantiga, operate to build a unique identity that finds a well-defined position among the other identities available on the Sardinian showcase. History, the relationship with honeybees, and an intimate knowledge of the territory combined with a sense of belonging are the tools that lead some Sardinian beekeepers to develop an autonomous vision of themselves and of the environment in some respect opposed to the dominant notions of biodiversity and the autochthonous. A glimpse at the history of Apiaresos highlights the mechanisms that underpin the process of identity construction and facilitate the analysis of the models used by the beekeepers to validate their indigeneity. Luigi is firmly convinced that a Sardinian honeybee does not exist. However, he believes that through the centuries, thanks to their action as pollinators, local honeybees have determined the emergence of the vegetal endemism that characterizes the uniqueness of the Sardinian landscape. Thus, honey is the expression of the Sardinian identity because it contains the pollen and nectar of autochthonous Sardinian vegetal species. History, tradition, informal knowledge, territoriality, and the concept of autochthonous species merge in the ‘issue of eucalyptus.’ Nowadays, eucalyptus is at the center of a number of controversies such as replacement of conventional forests, loss of soil fertility, besides also causing various hydro-ecological imbalances of an ecosystem. Alongside with these general factors, the issue of eucalyptus in Sardinia take on more local implications. As I mentioned above, the island of Sardinia is globally recognized for its rich biological diversity. Consequently, in developing the programs for the management of the environment and the landscape, the Sardinian council has to follow the guidelines established within EU policies for the conservation of the biodiversity in its regions. In this respect, programs such as Natura 2000 seem to support models of biodiversity safeguard based on the idea of ‘fortress of conservation,’ which, in the case of Sardinia, contributes to strengthening the image of an uncontaminated island, an authentic wild Eden. From this standpoint, the term ‘autochthonous,’ used as synonymous of ‘indigenous,’ defines the species that are ‘genuinely Sardinian’ and that would characterize the alleged authentic Sardinian landscape. Likewise, allochthonous species are perceived as the signs of deterioration that lead to the loss of integrity of the ecosystem. Coherent with this vision appear the environmental policies issued by the Sardinian regional governments during the past decades that aim to uproot the eucalyptus trees to replace them with autochthonous species or local ecotypes. Aside from biological reasons, it seems that cultural and historical matters contribute to attributing a negative value to the eucalyptus. Indeed, the first plantations of eucalyptus trees were planted on the island roughly since the second half of the 19th century, rapidly increasing at the beginning of the 20th century in projects issued by the Savoy governors for reclaiming the lands to stop the propagation of malaria. Framed in the discourses on identity hinged on anti-Piedmontese sentiments, the eucalyptus tree represents a living symbol of the subordinate role into which Sardinians have been confined by the ‘Savoy’s regime.’ Notwithstanding, the beekeepers see the eucalyptus for its melliferous properties. Nevertheless, the struggle over the survival of the eucalyptus is by no means over, and it continues to activate forms of tension between the social actors involved. Members of Apiaresos assert that policy-makers and formal delegates of the regional council do not take their expertise seriously. However, what is striking here is the emergence of rather different connotations of the notion of autochthony among the Sardinian beekeepers. On the one hand, the beekeepers of Terrantiga claim that although the eucalyptus has been present in Sardinia for two hundred years, it is not an autochthonous tree, it is not Sardinian, and therefore there is no reason to save it. This position appears to be informed by nationalist sentiments that see in the history of the importation of this tree a connection with the subordinate role of Sardinians by the Italians. Thus, according to this standpoint, the regional government should promote a new vision of beekeeping integrated into a system of ‘bio-agriculture.’ On the other hand, the beekeepers connected with Apiaresos claim that after two hundred years, the eucalyptus trees have become part of the Sardinian landscape. The eucalyptus is no longer imported from outsiders; rather it grows from the Sardinian soil. The presence of the eucalyptus is a sign of the toil of the great-grandfathers and the grandfathers that in many cases have benefited from the exploitation of these plants, or even they planted them with their own hands. In other words, taking a step back on the discourse of su connotu, the eucalyptus here is seen as part of the world handed down by the ancestors, thus it deserves to be saved to keep the world as known. Furthermore, the eucalyptus, with its great production, is considered to have contributed to ensuring a good business for the local beekeeping companies. Thus, although the eucalyptus remains an allochthonous species, all these factors contribute to give to these trees what it seems to be a sort of right of citizenship. It is clear that the term autochthonous can take on highly different meanings depending on the contexts and the purpose of its advocates. However, highlighting the tensions between autochthony’s ‘naturalness’ and history, the comparison of these different perspectives has shown again the total inconsistency and ambiguity of the notion of autochthony. The above exploration into the conflicting visions of Terrantiga and Apiaresos can help to highlight the discourses that are hidden behind the notion of autochthony. In blaming the policy-makers for their inadequate programs for natural resources and landscape management and attributing them a ‘boor attitude’ for their incapacity in understanding the peculiarities of the activity of beekeeping, the beekeepers are not simply clamoring to be included in managing the territory, rather they are asking to be acknowledged as members of the Sardinian agro-pastoral world. Furthermore, analysis of the empirical data shows that in the processes of the construction of identity, from which are formed part of the discourses on the notion of autochthony, the forms of the so-called ‘scientific knowledge’ are used in different ways to support rather different claims, relegating some others to subaltern positions. Striking is the position taken on by Apiaresos. 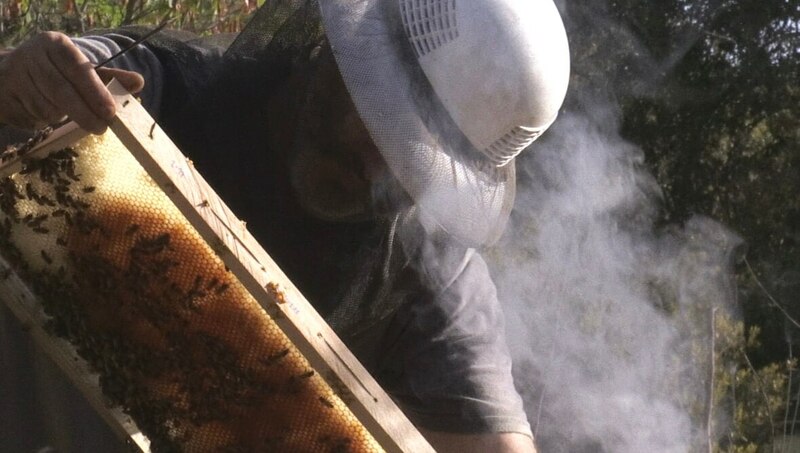 In reinterpreting the history and claiming a connection with the tradition in order to legitimize the right of having a voice in the decisions on the management of the territory, the beekeepers that pivot around Apiaresos seems to generate a new category of indigeneity that legitimizes their position in the Sardinian landscape. Furthermore, this process seems to enable these beekeepers to elaborate an alternative notion of autochthony that can be applied to all living beings such as plants, flowers, animals, honeybees, and humans. To this effect, the beekeepers seem to connect the notion of autochthony with the toil of the ancestors and to the world as is known through their memory. However, this porous vision enters into conflict with the politics aimed at creating an image of Sardinia as an endless island,  the island characterized by the wilderness of its inhabitants and its landscape. In the process of heritagization of the natural landscape of Sardinia, the policymakers seem to use the notion of autochthony as a quality-label to certify the authenticity, the Sardinianess of the flora and the fauna of the island. In this respect, acknowledging a sort of indigeneity in the Sardinian beekeepers would lead the policy-makers to reconsider all the categories of thought connected with the representation of the Sardinian identity and to reformulate the hierarchies of the knowledge in the management of biodiversity. Greca N. Meloni. “Making Indigeneity: The Beekeeper’s Perspective.” On_Culture: The Open Journal for the Study of Culture 5 (2018). <http://geb.uni-giessen.de/geb/volltexte/2018/13657/>. I would like to thank the editorial team and peer reviewers of On_Culture for their support and their comments. I am very grateful to Jakob Andersson for his language revision and I am thankful for the two anonymous reviewers for their critical feedback and their valuable suggestions. I would also like to thank Francesco Bachis for his precious advice. For the history of pre-nuragic and nuragic culture see: Maria Grazia Melis, L’Età del Rame in Sardegna: origine ed evoluzione degli aspetti autoctoni (Villanova Monteleone: Soter Editrice, 2000), and Ercole Contu, La Sardegna preistorica e nuragica (Sassari: Delfino editore, 2006). The law was issued by the regional government in 1995 with the aim of safeguarding and enhancing the Sardinian language as a fundamental aspect of the cultural identity of Sardinians. For the integral text of the law see the document “Legge Regionale 15 ottobre 1997, n. 26. Promozione e valorizzazione della cultura e della lingua della Sardegna,” accessed March 22, 2017: <http://www.regione.sardegna.it/j/v/86?v=9&c=72&file=1997026>. Giulio Angioni, Il sapere della mano: Saggi di antropologia del lavoro (Palermo: Sellerio, 1986), 137. The Giudicati were independent states that took power in Sardinia in the ninth century out of necessity when, due to the emergence of the greater presence of the Arabs in the Mediterranean Sea, Sardinians had to interrupt the connections with the central authority of Byzantium to become militarily and economically independent. The island was divided into four reigns or Giudicati, each of which had fortified borders and was administrated by a Giudice (Judge) who issued his or her own laws and rules. There were four Giudicati: the Giudicato of Cagliari with capital in Santa Igia, the Giudicato of Arborea with capital in Oristano, the Giudicato of Gallura with capital in Civita, and the Giudicato of Logudoro with capital in Porto Torres, Ardara and then Sassari. The ‘Carta de Logu,’ the code of laws written in Sardinian and issued by Eleonora d’Arborea at the end of the 14th Century. Although the conquest of Sardinia by the Aragon marked the end of the Giudicati, in 1421 the new rulers edited the Carta de Logu and confirmed its validity, extending its jurisdiction in the whole island. Angioni, Il sapere della mano, 135–137. In 1948 the Italian Constituent Assembly approved the Special Statute of the Autonomous Region of Sardinia. Nevertheless, Sardinians believed that the Constituent Assembly had worked for lessening the prerogatives of the Statute as they were defined by the Sardinian delegates who showed displeasure and disillusion towards the new Statute. Thus, from the very first day, the different political forces took up a long process aimed at reviewing the Statute to strengthen the juridical and economic autonomy of Sardinia, which it retained, however inconclusive, until today. The historian Mariarosa Cardia points out that towards the end of the 1970s and during the 1980s, the political forces gradually abandoned the old politics based on a vision of the autonomy of Sardinia linked to the political, administrative, and economic aspects, to move towards the ‘cultural’ specificities of Sardinia. In other words, during these years the politics show an inclination to consider the review of the Statute a fundamental instrument for enhancing and protecting the peculiarities of the ‘Sardinian identity.’ See: Mariarosa Cardia, “La grande incompiuta: la mancata riforma dello Statuto speciale della Sardegna (1948–2014),” in La Sardegna contemporanea: Idee, luoghi, processi culturali, eds. Luciano Marrocu, Francesco Bachis, and Valeria Deplano (Roma, Donzelli editore, 2015), 287–322. The anthropologist Tatiana Cossu pointed out that in this process two eras are considered to be the most representative of the independence of Sardinians: the era of the Giudicati and the age of the Nuragic culture. In the process of identity construction and of collective memory, the latter is used to transform the contemporary Sardinians into the living heirs of the Nuragic civilization, which according to this view, would have ruled the whole Mediterranean Sea. See: Tatiana Cossu, “Dall’identità al passato: il caso della preistoria sarda,” in Sardegna: Seminario sull’identità, eds. Giulio Angioni et al. (Sassari, Carlo Delfino, 2007), 119–125. Dating back to this period, for example, is the creation of the Sa die de sa Sardigna (literally the day of Sardinia), designed to ‘celebrate the Sardinian people and the Sardinian identity,’ a result of the interpretation of the historical events between the 1793 and 1796 in a deeply anti-Piedmontese key. See: Benedetto Caltagirone, Identità Sarde: Un’inchiesta etnografica (Cagliari: CUEC, 2005), 105–259. Shardna S.p.A. was founded by Renato Soru and Mario Pirastu in September 2000 to collect and study the DNA of people from Ogliastra, which ‘have been isolated for Centuries.’ The name refers to Shardana, a Mediterranean population appeared in the 2nd millennium BC and that according to some not confirmed theories should be identified with the ‘Nuragic Sardinians.’ See for instance “Ugas: ‘Sì gli Shardana siamo noi, il popolo che costruì i nuraghi’. L’archeologo presenta a Sassari il suo volume ‘I pirati che sconfissero i Faraoni erano i sardi antichi,’” in La Nuova Sardegna, February 23, 2017, accessed March 5, 2017, <http://www.lanuovasardegna.it/tempo-libero/2017/02/23/news/ugas-si-gli-shardana-siamo-noi-il-popolo-che-costrui-i-nuraghi-1.14927582?refresh_ce>. See for instance “Il muflone icona della Sardegna. Il Dna certifica: ha 4mila anni,” in L’Unione Sarda, August 30, 2017, accessed August 31, 2017, <http://www.unionesarda.it/articolo/cultura/2017/08/30/il_muflone_icona_della_sardegna_il_dna_certifica_ha_4mila_anni-8-639043.html>, and also Luciano Piras, “Alla scoperta degli animali nuragici del Supramonte,” in La nuova Sardegna, March 26, 2017, accessed March 27, 2017, <http://www.lanuovasardegna.it/regione/2017/03/26/news/urzulei-alla-scoperta-degli-animali-nuragici-del-supramonte-1.15097085>. Peter Geschiere, “Autochthony: Local or Global?,” in Translocality : The Study of Globalising Processes From a Southern Perspective, Vol. 4. eds. Ulrike Freitag, Achim Von Oppen (Brill, 2009), 207–228, here: 220. See “Colony Collapse Disorder”, United States Environmental Protection Agency, accessed January 10, 2018, <https://www.epa.gov/pollinator-protection/colony-collapse-disorder>. Since 2010, the European Union is engaged in a number of studies such as “Smartbees” or “Epilobee” aiming to ensure the welfare of European honeybees. See “EU efforts for bee health,” accessed June 20, 2017, <https://ec.europa.eu/food/animals/live_animals/bees/health_en>. Symptomatic of the interest of the media in the disappearance of the bees is the widespread of movies such as More than Honey, dir. Markus Imhoof (Kino Lorber: Germany, 2012), Queen of the Sun: What are the Bees Telling Us?, dir. Taggart Siegel (Collective Eye Film: 2010), or Vanishing of the Bees, dir. George Langworthy and Maryam Henein (Film Buff: 2009). On the discourse about bee losses in animated cartoons, see Michaela Fenske, “Zeichentrickfiguren als Retter? Das Bienensterben in der populären Unterhaltung,” in Menschen und Bienen: Ein nachhaltiges Miteinander in Gefahr, eds. Stephan Lorenz and Kerstin Stark (München: Oekom, 2015), 61–72. Lisa Jean Moore and Mary Kosut, Buzz: Urban Beekeeping and the Power of the Bee (New York: NYU Press, 2013), ebook pos. 41. On the so-called ‘Honeygate’ in Europe, see Paola Tamma “Catch The Buzz — Honeygate: How Europe is being flooded with fake honey,” in Bee Culture: The Magazine of American Beekeeping, accessed September 13, 2017, <https://www.euractiv.com/section/agriculture-food/news/honeygate-how-europe-is-being-flooded-with-fake-honey/>. See also “Unser Honig: Geliebt und gefährdet”, ARD Mediathek, accessed September 12, 2017, <http://www.ardmediathek.de/tv/45-Min/Unser-Honig-Geliebt-und-gef%C3%A4hrdet/NDR-Fernsehen/Video?bcastId=12772246&documentId=39466594>. David MacDougall, The Corporeal Image (Princeton: Princeton University Press, 2006), 225. See Sarah Pink, Doing Visual Ethnography (London: SAGE, Kindle edition, 2013). MacDougall, The Corporeal Image, 15–31. As highlighted in the permanent announcement, the group was created in 2015 to “freely talk about beekeeping in Sardinia, that for some aspects differs to the practiced in the mainland!” and so that the members “could write in Sardinian without someone asking for translation;” my translation. Pierre Bourdieu, Lire les sciences sociales 1989–1992 (Paris: Belin, 1994), 326–329. Tracey Heatherington, “Remodelling the Fortess of Conservation? Living Landscapes and the New Technologies of Environmental Governance,” in Anthropological Forum 22.2 (2012), 165–185. See the section “About us” in the website of Cooperativa apistica mediterranea, accessed July 3, 2017: <http://www.apimed.com/chi_siamo/>. Giulio Angioni, “Doing, Thinking, Saying,” in Europæa 1/2 (2001), 5–11, here: 9. Lisa Jean Moore and Mary Kosut have observed the emergence of personal approaches to the world of the honeybees in their study on urban beekeeping in New York. See Moore and Kosut, Buzz, 3. Giulio Angioni, Fare, dire, sentire (Nuoro: Il maestrale, 2011), 67. Terrantiga’s website, accessed July, 3, 2017: <http://www.terrantiga.org/>. See also one of the advertisements realized by the department of tourism of the Region of Sardinia to promote the island during the EXPO 2015, accessed December 27, 2017: <https://www.youtube.com/watch?v=r6ASLk32PPk>. See “Diario di un quadriennio (2007 – 2011)” in Apiaresos’ website, accessed July 1, 2016: <https://apiaresosdearbaree.wordpress.com/diario-di-un-quadriennio-2007-2011/2011-2/>. Luigi Manias, “Apiaresos: Le ragioni di un nome,” in Api buridane, ed. Luigi Manias (Ales: Nur, 2017), 51–54, here: 52. Ignazio Floris and Alberto Satta, Apicoltura in Sardegna: La storia, le api, i mieli (Provincia del Medio Campidano: Fondazione Banco di Sardegna, 2009), 21. Serafino Spiggia, Le api nella tradizione popolare della Sardegna (Sassari: Carlo Delfino, 1997), 91. Francesco Bachis, “Diversi da chi: Note su appartenenza e politiche dell’identità,” in La Sardegna contemporanea: Idee, luoghi, processi culturali, eds. Luciano Marrocu, Francesco Bachis, and Valeria Deplano (Roma, Donzelli editore, 2015), 710. See also Eric Hobsbawm and Terence Ranger, eds. The Invention of Tradition (Cambridge University Press, 2012). Luigi Manias, July 19, 2016, Ales, Sardinia; my translation. Luigi Manias, July 2016; my translation. Cosimo Zene, “S’Imbiatu: Gifts and community in central Sardinia,” in Culture and Religion 8.3 (2007), 291–312, here: 295. In Italy two species of honeybees are officially recognized: the Apis mellifera ligustica, known as the Italian honeybee, and the Apis mellifera siciliana, the Sicilian honeybee. Beyond them, local ecotypes are considered to be part of the biodiversity of the Italian territory. In Sardinia the entomologists have reported the historical presence of A. m. ligustica and an alleged Sardinian ecotype. See Ignazio Floris et al., “Searching for the origin of Sardinian honeybees: Morphometric comparison between samples from Sardinia and Northern Tunisia,” in REDIA XC (2007), 105–108. Giovanni Lilliu was a Sardinian archaeologist famous for the discovery of the Nuragic village of Barumini, and for his research into Nuragic culture. The informant here refers to the book “La costante resistenziale sarda” published in 2002, in which Lilliu elaborates his theory of the ‘constant resistant’ of Sardinians to the dominations from foreigner populations. Apiaresos’ website, accessed July 1, 2016: <https://apiaresosdearbaree.wordpress.com/>. Heatherington, “Remodelling the Fortess of Conservation?,” 166. See also Tracey Heatherington, Wild Sardinia: Indigeneity and the Global Dreamtimes of Environmentalis (Seattle, London: University of Washington Press, 2010). See for instance Regione Autonoma della Sardegna, “Deliberazione N. 23/21 del 16.4.2008” (16 April 2008), accessed March 22, 2017 <https://www.regione.sardegna.it/documenti/1_73_20080612103450.pdf>, 3, and also Regione Autonoma della Sardegna, “Piano forestale particolareggiato del complesso forestale dei ‘Settefratelli,’” accessed March 22, 2017 <http://www.sardegnaambiente.it/documenti/3_226_20150205213157.pdf>, 13–14. Floris and Satta, Apicoltura in Sardegna, 164. See “Programma triennale di controllo biologico della psilla lerp dell’eucalipto Glycaspis brimblecombei e monitoraggio delle problematiche fitosanitarie dell’eucalipto in Sardegna,” accessed March 22, 2017: <https://www.regione.sardegna.it/documenti/1_274_20121023092757.pdf>. See Deidda et al., “Emerging pests and diseases threaten Eucalyptus camaldulensis plantations in Sardinia, Italy,” in iForest 9 (2016), 883–891. Bachis F., Diversi da chi, 715. Emblematic in this sense are the advertisement released by the Department of Tourism, Craftsmanship, and Commerce to promote Sardinia in the United States, accessed December 27, 2017 <http://www.sardegnadigitallibrary.it/index.php?xsl=2436&s=17&v=9&c=4460&id=299999> and one of the advertisements realized for EXPO 2015, accessed December 27, 2017 <https://www.youtube.com/watch?v=EMgYQ9ZU_6s>. See Gisela Welz, European Products. Making and Unmaking Heritage in Cyprus (New York, Oxford: Berghahn Books, 2017), 127.